View of “Rene Ricard: So, Who Left Who?,” 2017. The poet Rene Ricard, who died in 2014, was once called “as hip as it gets . . . but he wasn’t cool.” There’s nothing cool about staking your own heart before a hardened audience. And in a post-Barthes world, neither is lavishing your authorial signature all over everything. 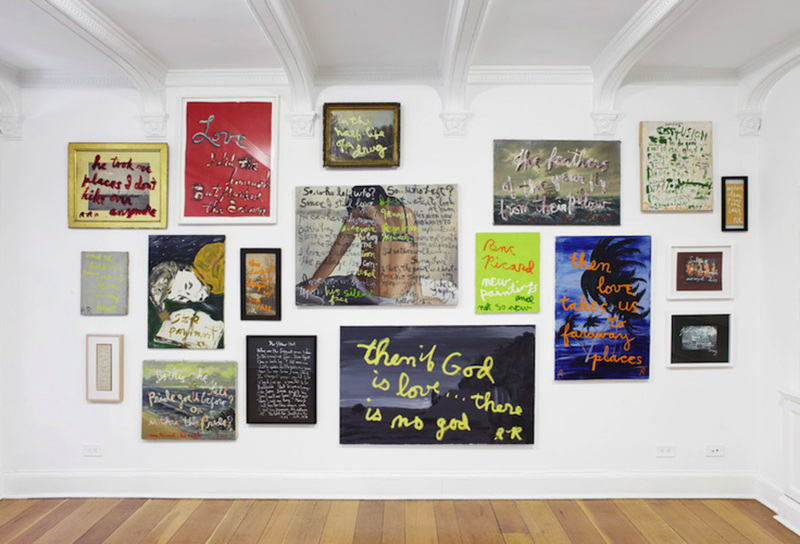 “Rene Ricard,” or his initials, often scrawled on the works here, are at the same scale as his painted poems, which are accusations, recriminations, reproaches, and, of course, odes. Over and over, spoken and written, he insisted on his name, not as a point of pride but rather as resignation to an inescapable fate. What a pity, having to be nothing but yourself when everything else can be taken away. Quite a few of these paintings, dating back as far as the 1980s––in addition to a 1977 video of the artist reading on a DIY TV program called Public Access Poetry—have never been shown before, and they don’t feel like they were made to be shared with many. These bombastic, declarative things seem best suited to showing up unannounced and unasked for, like missiles. The oil-on-canvas Untitled (‘Then If God Is Love…’), 2003, takes that first phrase over a generic black-and-white landscape and finishes it off with “There is no god.” R. R. was not here to help a girl out. The hasty look of Ricard’s works would seem to confirm that they didn’t have to be paintings at all. But we might listen better when the message is writ large, hung, and awaiting our reception. The targets we hope to reach via poetry are often missed, “and the heart slithers back under its rock,” as Ricard eloquently states in the video. At least the painted messenger can hover in your periphery, or color your vision.